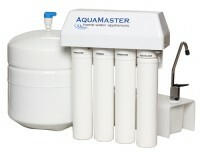 This system reduces lead, tastes, odors and chlorine by 99% and filters out 99.99% of micro-organisms. 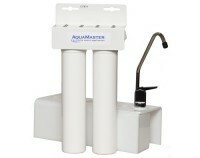 2-stage filtration. A 5-micron sediment filter removes particles 15 times smaller than a grain of sand. In addition, this system reduces lead, tastes, odors and chlorine by 99% and filters out 99.99% of micro-organisms, such as cryptosporidium and giardia cysts. Advanced 4-stage reverse-osmosis technology. A premium, long lasting, high capacity reverse-osmosis membrane offers the finest purification available – even when it comes to harmful nitrates. 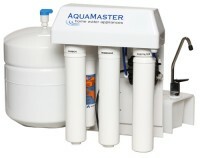 Reverse Osmosis at the forefront of filtration technology. Reverse Osmosis (RO) systems use pressure to force water through a semi-permeable membrane, allowing only the water molecules to flow through. It is the most effective treatment available. Same advanced 4-stage reverse-osmosis technology as the AMR4000 with the added benefits of a permeate pump that regulates production of treated water to keep the rejection water the minimum level. Water production and rejection rates vary based on water temperature, pressure and the level of total dissolved solids in the water. In our cold climate, a permeate pump effectively neutralize the effect of colder water keeping the rejection rate constant and at its optimum level.